Andy Kershaw and Lucy Duran explore music of ocean communities, sampling sounds in Galicia in Spain, Papua New Guinea, Salvador da Bahia in Brazil and the Solomon Islands. For this major series to accompany BBC One's 'Human Planet', Andy Kershaw and Lucy Duran go trekking across the globe to bring us music from the peoples of some of the world's remotest regions, visiting many of the places featured in the TV series. This week the focus is on the music of ocean communities. Galicia: Galicians consider themselves Celts, linked by sea travel with peoples in Northern France, Ireland and Scotland. Lucy Duran meets leading piper Xosé Manuel Budiño, and is invited to the village of Cebreiro for a party celebrating Celtic culture. 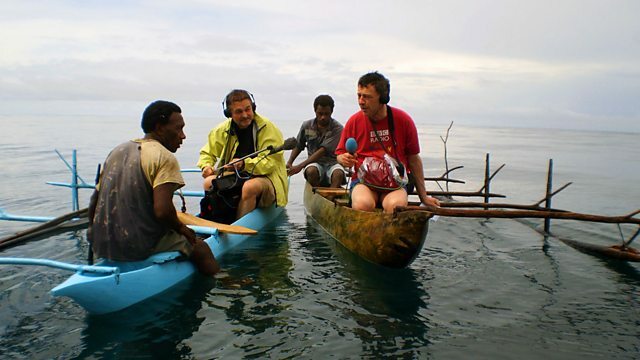 Papua New Guinea: To the accompaniment of the villagers, Andy Kershaw sets off on a shark fishing expedition with Blais, the singing shark caller from Tembin Village. Together the try to lure sharks with Blais's unique repertory of shark-calling songs. Brazil: Lucy Duran visits the coastal city of Salvador da Bahia, the ancient capital of the Camdomblé religion. This is the religion that uses old African customs and languages - it's practised on the seashore looking across to Africa, and the sea and its shells are crucial to the liturgy, and its music too. Solomon Islands: Andy Kershaw gets the gospel: the Deep Sea Canoe Movement is dedicated to keeping up continuous worship 24 hours a day on the paradise island of Malaita. Producers: Roger Short and James Parkin. BBC Recording made on-location by Sound Engineer James Birtwistle. BBC Recording made on-location by Sound Engineer Martin Appleby. BBC Recording made on-location by Sound Engineer Andrew Smillie. Lucy Duran learns about the Camdomblé religion in the coastal city of Salvador da Bahia. BBC Recording made on 6th April 2010 in Salvador de Bahia by Sound Engineer Martin Appleby. BBC Recording made on 7th April 2010 in Salvador de Bahia by Sound Engineer Martin Appleby. BBC Recording made on 8th April 2010 in Salvador de Bahia by Sound Engineer Martin Appleby.